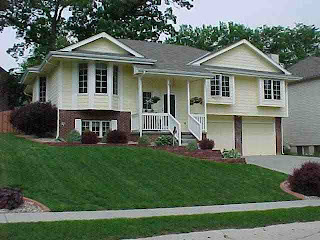 Angela May's Omaha Nebraska Real Estate Blog: RECENT PRICE REDUCTION! Custom Built Home! Motivated Sellers - Priced below assessed value of $192,000! 5 min to Offutt, 4 min to HWY 75, ½ blk to coveted Two Springs Elementary in quiet/respectable neighborhood. 2,500+sq ft, custom built home by quality builder. Mature trees & oversized deck in shaded backyard. Fully Finished Lower level with huge den/rec room, ½ bath, 4th Non-conforming Bedroom or office & new carpet! Low maintenance yard which is professionally landscaped and includes sprinkler system. Extended garage featuring built-in storage shelving. Beautiful eat-in Kitchen and professionally painted interior. Master Suite is a dream with walk-in closet & double vanity in Master Bath! Storage space abounds in this spacious home! Home Warranty Included!